SUMMARY: The Florida Inland Navigation District (FIND) is sponsoring a project to maintenance dredge the Intracoastal Waterway (IWW) channel to -10 ft Mean Lower Low Water (MLLW) — its federally authorized depth — in a 4.5-mile section from the Port of Palm Beach to the Town of Palm Beach Docks. This portion of the IWW channel has not received maintenance dredging since its original construction in the 1960’s; the project will restore shoaled areas (presently impeding navigation) to their federally authorized depths. Material from the IWW channel will be mechanically dredged by Orion Marine Construction, Inc., placed into a self-contained hopper barge, and transferred to the Palm Beach County Tarpon Cove Restoration Area. Dredging will begin on a 24-hour basis mid-February 2019 and is expected to continue for about 90 days. During the project, every reasonable effort will be made to accommodate normal, safe navigation operations. However, mariners should be aware that clearances within the IWW will be reduced and navigability will be limited during dredge operations. Mariners are urged to subscribe to daily email updates at FIND_ICWW_Dredging@orionmarinegroup.onmicrosoft.com for daily dredge position maps and potential impacts to navigation or call Loren Martinez at (813) 390-2269 for general questions concerning the project. 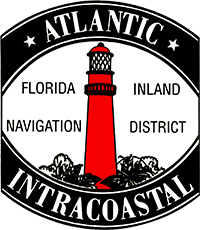 BACKGROUND: Palm Beach County residents and the area’s vital marine industry will benefit from easier navigation following the completion of the IWW maintenance project. The FIND is committed to ensuring safe navigational waterways that allow for the passage of commercial and private vessels. The project will result in significant increased economic benefits while providing for continued operation of the area as a boating destination and international marine hub. In order to remain competitive with other emerging popular marine destinations, Palm Beach County waterways must remain open and accessible to all vessels. Palm Beach County residents who make up the marine industry are some of the hardest-working people in our community; continued and necessary maintenance of the IWW facilitates vessel access to marine facilities and helps protect marine industry jobs. The marine industry’s estimated 8,300 marine-related jobs in Palm Beach County comprise one of the largest portions of the estimated industry’s $874 million annual economic revenue to the county. DESIGN: The federally-authorized navigation channel is 125-ft wide (base width) with 3 (horizontal):1(vertical) side slopes, and a bottom elevation of -10 ft MLLW. The project will also include up to 2-ft of allowable overdepth dredging (Figure 1). Based on a February 2016 bathymetric survey, the project will remove approximately 84,000 cubic yards (cy) over a project area of 67 acres. Placement within the Tarpon Cove Restoration Area will occur at locations identified by Palm Beach County. Placement will occur by barge mounted mechanical equipment. Figure 2 provides the overall project location map. Material from this project will be use by Palm Beach County's Tarpon Cove project.